Located near the juncture of I-95 and I-795, Wilson, NC is great place to live … and with Raleigh just 40 minutes away, the city becomes even more appealing for families and professionals. But when your used car can't even make it to the freeway, your convenient suburban home can become incredibly inconvenient, and you're left with the need to upgrade and get rid of that old, unreliable car. Unfortunately, private buyers aren't interested in cars that are anything less than perfect, and especially cars that don't run at all. And local dealerships in Wilson, NC, lack the skills to properly appraise damaged cars. You may think that you can just sell your junk car to the junkyard, but at the junkyard you'll lose the value of the premium options it contains and you will have to find a way to tow your vehicle there. Don't worry. DamagedCars.com can help, because we buy junk cars! DamagedCars.com buys cars in all conditions and at all ages. We'll give you an offer for your car in Wilson, NC, in as little as 90 seconds, conveniently online. You can sell damaged cars and salvage cars to us, and we will give you full value, including the value of any extras that your car has! What kind of cars do you buy in Wilson? At DamagedCars.com, we buy most makes and models of vehicles. We buy cars in any condition, too, even those that don't run. In fact, we specialize in buying salvage cars, giving you a way out that you won't find at any dealership or junk yard. Whether your car has a blown engine, has been totaled, has a costly transmission repair or even has suffered flood damage, you can get a fair price when you sell to us. What do I need to sell my car in Wilson? Then, simply remove the license plates and request your quote. We'll come pick it up from your home or office at the time you pick, and you will get payment the same day we come! It really is that easy when you work with us over other Wilson NC junk car buyers! How much can I get when I sell my car in Wilson? Simply enter the accurate information about your car into our online quote system, and we will instantly evaluate what it is worth. Unlike others who buy damaged cars in Wilson NC, we will take into account all of the features on your car. Your offer is personalized just for you and your specific vehicle, which ensures it is a fair value. Why should you choose DamagedCars.com when selling your car? We buy cars online and work with partners all over the country to recycle vehicle parts. This means selling to us is a way to be environmentally responsible, even when dealing with a damaged or broken car. We're active members of the Automotive Recycling Association and United Recycling Group, and we have strong ratings and a solid reputation. You can trust us to give you a fair offer, which you can consider and accept when you're ready. Learn how easy it is to sell your car to DamagedCars.com! Wilson was the birthplace of Branch Banking and Trust Corporation (BB&T), which today is one of the top financial holding companies in the country. It's still one of the area's top employers. Where do you buy junk cars in Wilson? 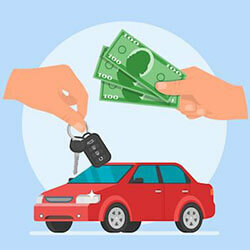 Looking for cash for cars in Wilson NC? We buy junk cars in Wilson and all of the surrounding communities. After you accept your offer, we will come to your home or busies and pick up your car for you. There's no fuss and no hassle. Simply enter your information, accept your personalized offer, and sell your broken car with DamagedCars.com. What should you know before selling to a junkyard or private buyers in Wilson, NC?